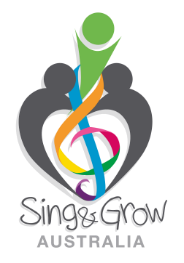 Playgroup Queensland - Sing&Grow is a subsidiary project of Playgroup Queensland. PG QLD supports Queensland families through a range of early year’s programs. These programs are designed to promote early year’s development, build community capacity, and create pathways and opportunities for vulnerable families so that all can enjoy the many benefits that a quality play experience offers. Kids Music Beat - This business is owned by Kate Williams, a Registered Music Therapist with valuable early childhood knowledge. They offer good quality instruments and equipment at a reasonable price. Music Patch Songs - Music Patch Songs for Children of all Abilities features the song writing of Grace Thompson, an Australian registered music therapist. Care has been taken in the lyrics, structure and arrangement of each song to make the songs relevant and accessible to children of all abilities. These songs are available for free download, with the hope you will use and enjoy them with your children. Raising Children Network - Funded by the Australian Federal Government, this website is produced by the Parenting Research Centre and the Murdoch Children’s Research Institute to provide information that can help parents with the day-to-day decisions of raising children from infancy to adolescence. Kids Count - Produced by the Australian Childhood Foundation, this website offers multi-lingual information to assist parental understanding of childhood development and the role parents play in optimising outcomes for this. Audio options are available on this site. The Bub Hub - The Bub Hub site offers information on a range of topics, including pregnancy advice, baby info, parenting advice, comprehensive Australian directory of services. Merrily Merrily Book - This link takes you to one of our favourite music book resources called "Merrily Merrily". This book, was compiled by a group of Australian Breastfeeding Association members and contains lyrics and music to over 200 songs. An accompanying CD is also available. We refer to this book in our "Sing & Grow Together: Music Through the Day" resource. The New Useful Book - This is another one of our favourite music book resources. It is packed with song and craft ideas for use with young children. The song materials are drawn from the ABC play school program. We also refer to this book in our "Sing & Grow Together: Music Through the Day" resource.